By continuing to read this page, you agree to be memetically inoculated by a Class II memetic hazard so as to perceive the memetic entity described in this file. There is currently no way to undo this memetic inoculation. Individuals assigned to SCP-2576 are required to be inoculated. To be inoculated, please observe the image contained in this file, and read the caption beneath it. Personnel who are properly inoculated should be able to perceive the image as it is described in the caption. 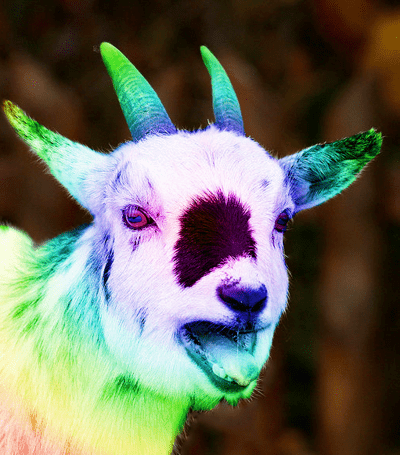 Contained within this image is a memetic entity that appears to be a multi-colored goat. Properly inoculated individuals should be able to perceive this goat. Special Containment Procedures: SCP-2576 and Joseph Abbasi are contained in a low-security dormitory at Area-12, and are under the jurisdiction of the Foundation Parazoology Department. Joseph Abbasi has expressed no desire to leave Area-12, and as such will likely sustain SCP-2576’s containment indefinitely. Research into SCP-2576’s status in the event of Mr. Abbasi’s death is ongoing. Description: SCP-2576 is a memetic non-entity, capable of being perceived only by humans who are aware of its perception by other humans. SCP-2576 resembles a small Capra aegagrus hircus, or common domesticated goat, whose outermost layer of skin and fur is a constantly shifting pattern of all colors of visible light. Despite its ability to be perceived by humans as an actual, physical entity, testing and video observation of SCP-2576 has concluded that it does not exist except as a memetic device within human minds. SCP-2576 usually acts like a typical domesticated goat, with several exceptions. SCP-2576 cannot interact physically with the world around it, and is capable of moving between walls and other solid objects. SCP-2576 does not appear to require sustenance, though can be perceived as attempting to eat grass or other plant life it encounters. SCP-2576 can communicate with humans, usually in their native tongue, but does not produce actual sound, instead projecting its voice as a memetic influence within a human mind. Individuals who hear SCP-2576 speak to them find it difficult to describe the voice they are hearing, and their descriptions usually conflict with each other. SCP-2576 self-describes as “Discordious, the Harbinger of Chaos”, and claims to be a powerful memetic entity that has become trapped within the form of a memetic goat by Joseph Abbasi (formerly SCP-2576-B), a goat herder from Zhob, Pakistan. Despite consistent testing on Joseph Abbasi that has been unable to produce any evidence that Mr. Abbasi exhibits any anomalous qualities whatsoever, SCP-2576 does not appear capable of existing in any form outside of a range of roughly 30m from Mr. Abbasi. While this seems to cause SCP-2576 a considerable amount of distress, since being contained by Foundation personnel SCP-2576 appears to have resigned itself to its current existence, preferring to spend its time acting like a goat and attempting to proselytize to Foundation personnel near Mr. Abbasi. SCP-2576 was discovered by Joseph Abbasi in 2009, and was shortly thereafter contained by Foundation personnel after reports of a ghostly creature haunting a Pakistani man were circulated on the internet. The following is an interview with Joseph Abbasi, shortly after his collection by Foundation personnel. SCP-2576’s dialogue was transcribed by an outside observer. Dr. Baqoori: So tell us about the night you first saw the goat. Mr. Abbasi: Well, you have dreamed about work, yes? I think most people have. I dream about goats sometimes; that is my work. So that night, I sleep later than usual, and restlessly. SCP-2576: Restless and filthy, the foul mind of a man. Restless because of the presence of Discordious, undoubtedly. Mr. Abbasi: Will you give it a rest for five minutes. (SCP-2576 is silent.) Thank you. In my dream, I saw the sky colored with the colors of the rainbow. Flashing across the sky, very bright. Then I saw something coming out of the sky, wrapped in the colors. It looked like an eye, but it was also many eyes, and it spun very, very quickly. When it looked at something, that thing was destroyed. Black lightning came down around me, striking and disturbing the ground. It was very uncomfortable, and it was not long before the eyes settled on me. Dr. Baqoori: What happened then? Mr. Abbasi: Pooki! Enough! (Mr. Abbasi slaps the entity, which despite its lack of physical presence reels from the strike and glowers at Mr. Abbasi from the corner of the room.) I named the goat Pooki. It does not like it very much, but I do not like being told about the wretched undulations of humanity’s sins while I am trying to sleep, Pooki. (Pauses) The monster in the sky settled its gaze on me, and for a moment I felt an intense heat. But then I remembered my goats, and was comforted. The next thing I knew, I had opened my eyes from my dreaming and Pooki was standing before me. He was very confused, I think. It took him some time before he settled down. Dr. Baqoori: You said earlier that others did not believe you at first. Mr. Abbasi: No… I don’t think other people can see Pooki until they are told he is there. They cannot hear him, either. He doesn’t seem to like this either, since he mostly likes to bother people. (Laughs) He was not always a rainbow goat. At first he was a regular goat, and several days later I found him looking like he looks now. He cannot do much, but he can make himself rainbow colored, so he did that. I think it was out of spite. Dr. Baqoori: Has the goat ever harmed you, or anyone else? Mr. Abbasi: No. You know he’s not really there, right? He’s not real. Mr. Abbasi: Pooki, go lie down. SCP-2576: I am Discordious, Harbinger of Chaos, and I will come for you, domesticated human sheep, petrified of true power. I taste blood and steel. YOU ARE UNDER ATTACK. (Pauses) But I will go lie down, as I desire to rest for a short time. (Glares at Mr. Abbasi and Dr. Baqoori) You would do well to tremble amongst yourselves while I slumber. Dr. Baqoori: Is it always like this? Mr. Abbasi: Usually. But he actually really enjoys being scratched behind the ears, if you can believe it. That usually calms him down. Oh, and oats. He loves oats. He can’t… he doesn’t actually eat them, you know. But he goes through the motions, and that seems to make him happy. Dr. Baqoori: Why do you think it looks like a goat? Mr. Abbasi: Well… I think wherever Pooki came from, he must have been a big deal. He came here expecting to be a big deal here too, but… how big a deal can something be if it can get trapped as a dream goat in a poor herder’s head? (Laughs) He’s funny, though. I don’t mind keeping him around. Better here as a goat than somewhere else that he could cause trouble, eh? The following are recorded incidents between SCP-2576 and Foundation personnel. Any personnel who encounters SCP-2576 is encouraged to file a report with the SCP-2576 Research Team at Site-17. Summary: Dr. Lauren Palmer was confronted by SCP-2576 during breakfast. SCP-2576 spoke fervently to Dr. Palmer about “undoing the vile aberrations of her unclean flesh”. SCP-2576 continued for several minutes before growing tired and falling asleep on the ground near Dr. Palmer’s table. SCP-2576 was shortly thereafter collected by Mr. Abbasi and returned to their containment quarters. Summary: SCP-2576 entered the wall of the testing chamber during routine testing of SCP-████. SCP-2576 remarked on “the frailty of this dismal existence” and “the absolution of truth that all wicked souls must face”. Became distracted by Dr. Moore’s laser pointer before eventually returning to Mr. Abbasi, who was undergoing a routine examination in the next room. Summary: SCP-2576 entered Asst. Director Sinclair’s office during a meeting between the Assistant Director, Director Aktus of Site-81, and Director Orwell of Site-63. SCP-2576 attempted to get the attention of the three directors in order to proselytize to them, but was ignored. After multiple attempts to interact with the directors, SCP-2576 became quiet for a time and watched the directors from the corner of the office. Some time later SCP-2576 approached Asst. Director Sinclair, who proceeded to scratch SCP-2576 behind the ears and offer it some oats, which it promptly was perceived to be seen eating. SCP-2576 reportedly wagged its tail throughout the exchange.